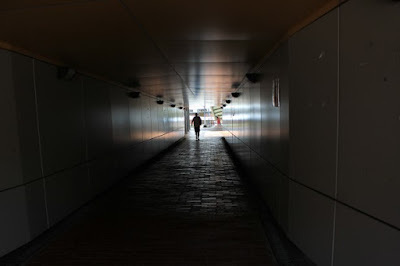 His heavy footsteps resounded off the walls of the underpass. He smelt the squalid homelessness of life down here, grateful he’d crawled out. He liked the new life he’d created, especially breaking in the new recruits, the handprint on the misted window of his car reminding him of that pleasure. He smiled and got in. No job, no prospects, no home – his soul longed for peace as his souls navigated darkness. The frost formed like the deepening desperation in his life. There was only one option to follow; the light. Step by step, false or not, he longed for His unconditional love. Meredith paused as she passed by the stranger’s feet, bare-naked for all the world to see. Beyond, she could see him sprawled on the bench, reading Proust, oblivious to the fact his toes were mere inches from her hips. Odd right toe, but mild-scented feet. Intellectual taste. He could be my guy. Wow. That's the seed for an entire movie plot in just 55 words. Impressive! She woke up suddenly hearing a ragged sound that stormy night. She felt someone was knocking at her door and there were threatening footsteps. There was no soul but she saw someone's hand-print on her glass window. When she opened it, "Trick or Treat?" the unsightly Halloweeners asked. Argh! I was late. Sorry, I didn't see the tweet until just now.